June month went down as a relatively happy and joyous month. Despite the scorching heat that the country felt all this month, rummy players were able to cool off with some solid promotions from us. DeccanRummy.com, India’s fastest rummy card game website, is synonymous with exceptional promotions and high-octane thrilling tournaments. If you are a regular at Deccan Rummy, you may very well know what we are talking about and had you missed it, you’ve missed a lot as a rummy player. Wondering what is it? Yes, we are talking about Social Sharks tournament worth 1 Lakh that is conducted every month. Deccan Rummy’s Social Sharks tournament has been a rage since it started off three months back. Players actively took part in the quizzes that we organized for issuing the free tickets to Social Sharks tournament. Who doesn’t want to take a shot at the hefty prizepool of Rs. 1 Lakh? Given the huge prize up for grabs, every player gave their best in the tournament. In addition to the free tickets, there was also a buy-in option available for Rs. 150 through which many players actively participated. 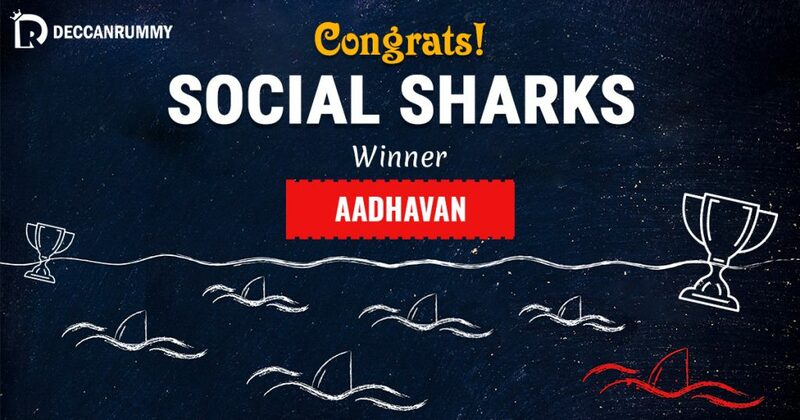 This June Month’s Social Sharks tournament was taken down by the user “aadhavan”. It certainly wasn’t an easy win for him by any stretch of imagination as he had to fight off the likes of many rummy experts. Taking a tournament down is always special as unlike games that sees a familiar audience, tournament sees lots of participants from all over the country. It’s the random element that heightens the speciality in these kinds of tournament. The player for all his intents and purposes may be pitted against the best rummy players in the country that he might have never seen before. That’s why we mention a tournament win is greater by magnitudes than a game win. Deccan Rummy team extends our dearest congratulations to Aadhavan for winning the tournament against all odds. It is players like him who send ripples of excitement across the Indian rummy fraternity with encouraging performances like this, that continues to pull many players towards this wonderful tournament. We would also like to congratulate “ksantu” “shafirockzz” for their incredible effort in securing the second and third position in the tournament. We expect both of them to win a tournament sooner than later after having seen their stupendous game plays. Deccan Rummy also likes to congratulate each and every participant in this game. Without your active support, the tournament wouldn’t have been this much successful. Social Sharks would continue to run once every month. In the event you didn’t make the cut this time, there’s always a tomorrow. Keep checking our facebook posts and participate in all the contests that we conduct to get your free ticket for the tournament. Whether you like to play rummy for cash or play rummy online free, we have sufficient number of games to keep you occupied. Happy Playing! How to Earn money playing games online?